Extremely practical and safe fish or dive boat. Can be fished from entire length of boat: bow, stern and roof. Grab rails everywhere, inside and out. Front and rear dive ladders, and ladder to top helm. Air-tight chambers around and within hull. Only one other like this ever made, the other is in the killer whales photo. Custom aluminum cover with alum rod holders over rear deck. 2005 Honda 225hp w/500 hours & 15hp w/5 hours. The 15hp has remote start and trim/tilt as well as pull start. 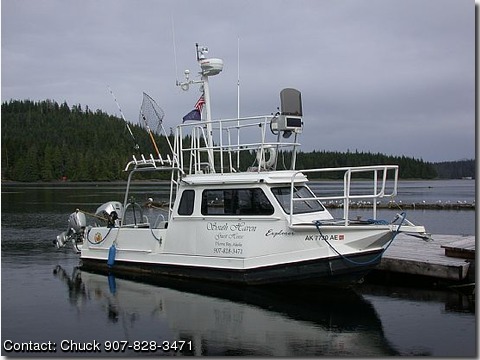 Electronics include Standard vhf, Garmin fishfinder, Raytheon gps & radar. Porta potty, 5 bench aft seats outside cabin. Set up for para sailing with large winch under the rear deck. Includes very nice dual-axle aluminum Rolls Tropic Trailer with 4 wheel disc brakes. Easily barged to Seattle, WA. I bought this boat in Florida boat in 2004, from the original owner, who stored the boat on a hoist. It is my daily commuter, and an occassional recreational fishing boat. It is truely a great handling and safe boat. Check the prices on these boats when new. Take over loan of $22,000 with monthly payments of $280.